Shorts have box pleats front and back, waistband and side zipper. Tuck-in or over-blouse has straight yoke front and back, narrow collar and long or short sleeves. Blouse and scarf may be made of three kerchiefs. 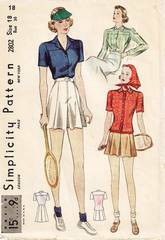 Pattern is used and complete with The Simplicity Primer Step-by-Step Illustrated Instructions sheet. Unprinted pattern pieces. Envelope is complete and in good, well preserved condition.